New Brunswick Progressive Conservative Leader David Alward has conceded defeat in the province's election and announced he will resign as his party's leader. Progressive Conservative Leader David Alward has conceded defeat in Monday night's election and announced he will resign as his party's leader. 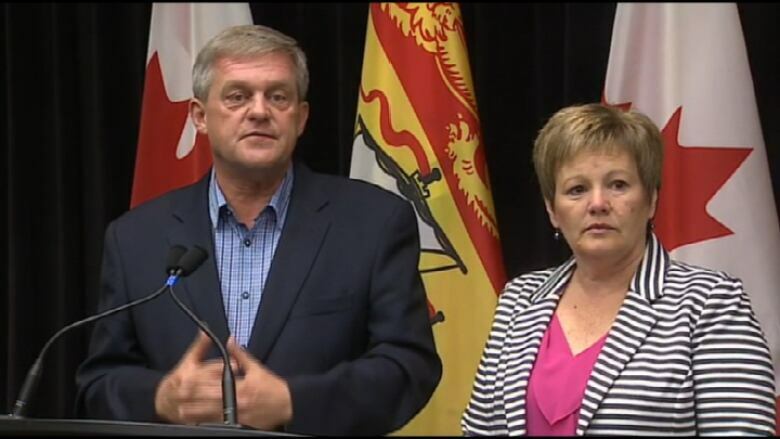 An emotional Alward announced his future at a news conference on Tuesday afternoon. He said he was "deeply disappointed" by the results, but he was clear about his future. "It is with a heavy heart that I announce my resignation as leader," Alward said. David Alward appeared at a news conference on Tuesday with his wife, Rhonda. 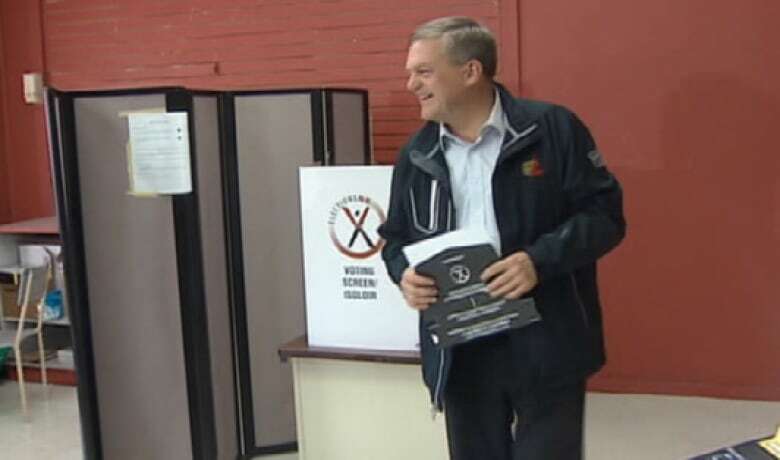 Alward conceded defeat and announced he will relinquish his party's leadership. (CBC)He said he will consult with his party's leadership to select an interim leader. Premier-designate Brian Gallant issued a written statement late Tuesday afternoon, thanking Alward for his service and dedication. "We haven’t always agreed on the proper path forward, but never have I doubted his deep commitment to our collective well being," Gallant said. He plans to meet with Alward on Wednesday to discuss the transition process, he said. "We are at a critical juncture in our collective future. Some difficult decisions lie ahead. But I promise all New Brunswickers that I will work incredibly hard to ensure our province moves in the right direction," Gallant said. Alward said he wished Gallant all the best in the next four years. While he is stepping away from the helm of the Tories, Alward said he will not leave public service. "I will do everything that I can do to continue to work to build our province and to make my community stronger," he said. The Liberals won 27 seats in Monday's election compared to 21 for the Progressive Conservatives and one seat for the Green Party. Prime Minister Stephen Harper issued a statement on Tuesday that thanked Alward for his service as premier. 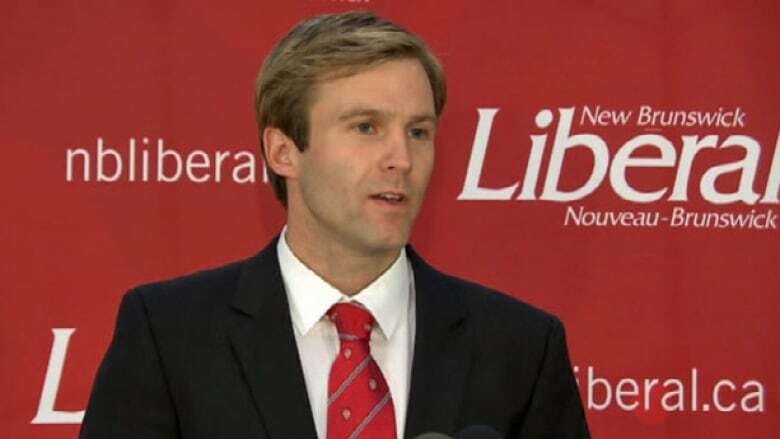 Brian Gallant's Liberals won 27 seats in Monday's New Brunswick election. (CBC)“I would also like to thank the outgoing premier, David Alward, for his contributions to New Brunswick and to Canada during his time as leader of the province, and wish him the very best in his future endeavours," Harper's statement said. Alward based his entire re-election campaign on the need to embrace the shale gas industry and to create jobs in the natural resources sector. The outgoing premier said he is proud of his campaign and he understands the issue created regional divisions in the province. He said he understands that Gallant's Liberals won a mandate with a call for a moratorium on the industry until more study can be done. But Alward said he hopes the next premier looks seriously at how the industry can create jobs in the province. "I certainly hope that the premier-designate will find the courage to do the right thing and continue to move forward," Alward told reporters when asked about the future of the shale gas industry. How much room Gallant has to move on the shale gas issue remains to be seen. On Tuesday, Liberal Chris Collins, a former environment minister, said he believes shale gas opposition was key to his election in Moncton Centre. The Liberals also won both Kent County seats where opposition to shale gas has been fierce. However, the Tories won several seats in central New Brunswick and in the Saint John area, which would benefit or stand to gain from developing the industry. PC Leader David Alward won for the fifth time in his riding in Monday's provincial election, but was tossed from provincial power. (CBC)With results slowed to a trickle late Monday and many questions surrounding the use of new vote tabulator machines by Elections New Brunswick, the Tories closed down Alward's headquarters in Woodstock without reacting to Elections New Brunswick's results. The confusion surrounding the vote tally led Jason Stephen, the president of the Progressive Conservative Party, to call for a hand count of all ballots before the party would accept the results as reported. Alward said Elections New Brunswick needs to review what happened with the vote-counting system. But he said he has confidence in the independent agency. "But barring something extraordinary, then the results were what the results were and I accept that and that is part of the democratic process," Alward said. "But what we do need to make sure, at the same time, is that New Brunswickers, voters, have full confidence in the voting process, that it is accountable, it is transparent, it is independent. There is work Elections New Brunswick will have to do between now and Friday. We will be following that very closely, but we respect that." Michael Quinn, the province's chief electoral officer, acknowledged people may have "valid concerns" about the vote counting process, but added, "We have complete faith in it." Quinn said early Tuesday morning he does not believe a recount is needed. "There is no question that this process tonight has had delays which were unforeseen and uncalled for," Quinn said. "There is no question in our mind we will come up with the correct result. It will be longer than we had anticipated and we wanted, but we will have the correct result."